If you are just getting to know what horse racing is, then brace yourself as there is plenty to learn… and we’re going to try and teach you what horse racing is and explain several things that will help you understand what the whole concept is about. For starters, the most raced horse type is known as a thoroughbred. Horse racing enthusiasts follow things such as racing form guides and form guide to find out when and how to back a runner. But before we get ahead over ourselves, horse racing is an event that follows a particular rhythm, intensity, and language that you will not see in any other event. As you head out to the racing track, you will require a racing form guide and a program. Fortunately, these are available for purchase when you arrive at the runway. However, if you wish to follow the race from home, you can go online and search for the best online betting site. The program you purchase will be filled with relevant information concerning the day’s races, information about the runners (horses), and the animals’ morning line odds. The program also features the names of the jockeys riding the runners, race distances and plenty of useful information. The programs and racing form guides are mostly sold near the entrance of the track. The instance you arrive at the race track, it’s important that you locate the most appropriate place to seat. In plenty of tracks, you will have to pay an extra fee if you either want to reserve a seat or if you wish to gain entry into the clubhouse. There are individual tracks that avail box seats for track goers. After settling down in your seat and have had ample time to go through the track program and the racing guide form, the next thing is to check out the runners (horses). Paddocks are the best places to observe the horses. Paddocks are places that horses get saddled before they walk to the starting gates. After saddling, the animals walk around a ring. The ring is where you have the opportunity to observe and see how your horse looks. It’s your chance to examine adequately the runner and ensure that he is relaxed, alert, loose and light on his/her feet. Make sure that your chosen runner isn’t sweating profusely and has a shiny, healthy coat and is ready to race. After studying the racing form guide correctly, and you’ve had a hard, long, and keen look at a horse, it’s time you placed a bet. However, before you go ahead and place a bet, kindly note that unlike other gambling forms, you will not be playing against the house in horse racing. The whole horse racing concept is a competition with the individuals around you. Hence why it is highly possible to win and win big at the races. A point of advice, as you compete against other people in public, you are advised to invest the time you require to beat the competition. Pari-mutuel wagering is the term used to refer to playing against other horse gamblers. The money wagered is pooled. Kindly note also that a different pool is kept for every type of wager. If you can win your bet, you earn part of the pool. The amount in a pool is dependent on the number of people that succeed alongside you, the good thing about pooling is that there is always a winner. Daily Double: Daily Doubles demand that you select a winner of two consecutive races, the pick should be before the first race is run at the sequence of runs. Daily Doubles are offered for the first and last two horse races of every racing card. Pick 3: You make money if you successfully select the winner of three serial races. However, you place the bet prior to the first race of the sequence. Pick 4: You make money if you settle on a winner of four serial races. The bet you place need to be done before you the races begin, and you must pick four winners of four different races. Head To Head: There are certain tracks that offer bettors head-to-head wagers (H2H). The H2H wagers are a race within a race. You have to pick a runner of the two designated horses in the race. When your runner finishes at the front of the other runners, you end up as the winner. However, your runner doesn’t have to win, place or show, it only needs to beat the other horse you bet against! Allowance: A type of horse race (non-claiming) with special entry conditions. Claiming: A race that features runners on sale at a price that is predetermined. The runners get claimed before they get to the track; however, the new owner will not take over the control of the horse not until after the race begins. Derby: A race (stake) for runners aged three and above. Distaff: A race runner only by female runners. Handicap: A race, mostly a stakes race, horses here are given weights to carry in line with the race conditions. Maiden: A race setup for non-winners. Marathon: A track event covering a distance of one and a quarter miles and even longer. Oaks: A stake race meant for three-year-old fillies. Route: A track event ran at a distance of a mile or longer. 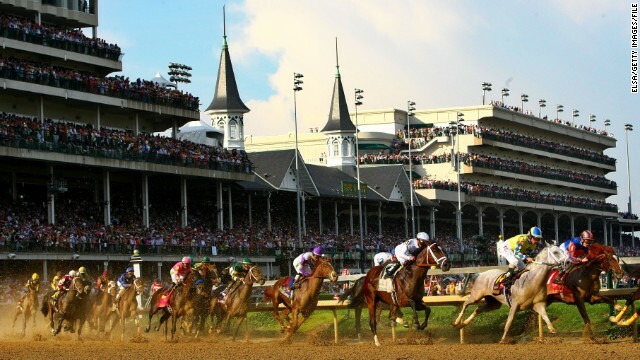 Kentucky Derby: The first event was run in 1875, if you are looking for history and tradition, you should check out the Kentucky Derby. The Derby is the race in which owners, trainers and jockeys look for a win. A win at this event is a career changer and besides, it’s an event that racing fans look forward to attending the most. Breeders Cup: The event was first held in 1984, and it changed the face of horse racing. Time went by, and the Breeder’s Cup was the determiner of the divisional championship. Races that were previously necessary turned into prep races for the Breeder’s Cup. The Cheltenham Festival: A United Kingdom’s National Hunt racing meeting. An event where the best UK and Irish horses take part. The festival is held every March at the Cheltenham Racecourse in Cheltenham in Gloucestershire. The Grand National: An annual National Hunt Horse race event that takes place at the Aintree Racecourse in Liverpool. The event was first held in 1839 and is a handicap steeplechase event that covers four miles and three-and-a-half furlongs.The runners cover 7.41 kilometers, and they jump 30 fences while covering two laps. The event is the most valuable event in all of Europe and attracts a cash purse of £1 million. Melbourne Spring Carnival: The highlight of the horse racing year in Australia. The event comes together to bring the best of Australian and international thoroughbreds for a cool fifty day. The event is nothing short of a world-class horse racing action. The entire event has a carnival like atmosphere that lights up Melbourne during Spring Carnival. Caulfield Cup: Now the world’s richest handicap race that covers a distance of two thousand four hundred meters. The race is Australia’s second largest cup race trailing the Melbourne Cup. Caulfield Cup is a premier race of the three-day Caulfield racing carnival that attracts fans in droves. Tony Samboras is a professional sport writer who writes about soccer,boxing,and horse racing.